Hexagon International Hotel Villas & Spa is located in Martintar area, 5 minutes from Nadi International Airport and 5 minutes from Nadi town. 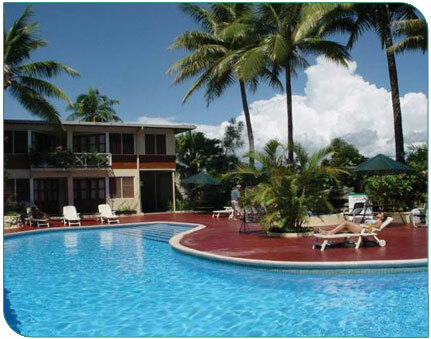 It is a popular Nadi Hotel for staying over on your way to or from an outer island, or for the holiday maker seeking a central Nadi base from which to explore the mainland and the Islands. Close to restaurants and the entertainment area with a supermarket and shops next door. Also close to Nadi Town. 24 hours reception and security available. Has 3 conference facilities, 3 pools and a wide range of accommodation units from hotel rooms to 1, 2 and 3 bedroom apartments. Also has an inhouse spa. Transfer: The Hotel offers FREE transfers to and from Nadi Airport for International Flights ONLY. Full flight details is required for hotel pick up. Cancellation Policy: If cancellation is done inside 72 hours prior to arrival a one night fee will apply. All cancellations must be in writing by either fax or e-mail and a confirmation of cancellation obtained. No Shows - A no show will result in full payment being demanded for the number of days booking was made for. Late check – out until 5pm will incur a charge equivalent to 80% of the room rate, subject to space availability. Check - outs after 5pm are charged a one night’s rate. © Copyright 2010 Hexagon Group of Hotels, All rights reserved.